The Bermuda Economic Development Corporation hosted the first ever BYOB – Be Your Own Boss, Student Entrepreneurial Workshop on August 6th and 7th. Nineteen college-age students with diverse areas of study came together at the HSBC Harbour View Centre for two half-days of learning and fun. The students were divided into four teams based on their shared interests and were given the task of creating their own business plans. On the first day, after learning the fundamentals of business planning with Joe Mahoney, the students held business meetings with experts from the BEDC, the Economic Empowerment Zones Agency [EEZA], HSBC and Expertise Limited. 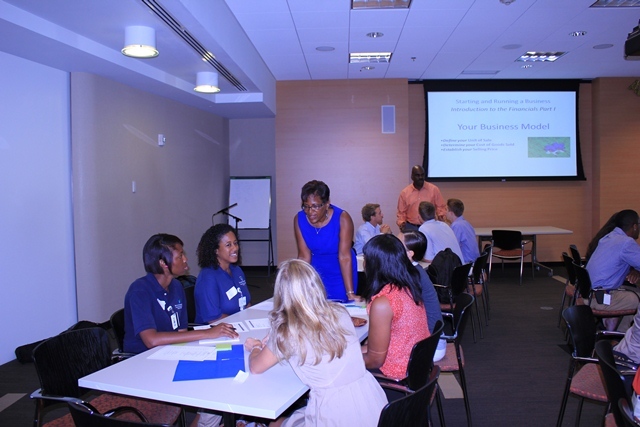 Lucrecia Ming, Erica Smith, Regina Simmons, and Belinda Chiaramonte hosted the ten minute meetings with each group. Mr. Mahoney, the Founder and Director of the Youth Entrepreneurship Initiative of Bermuda, gave students a crash course in business basics. Drawing on these resources, the teams were able to craft realistic business models replete with fixed and variable costs and projected sales. The students were encouraged to pursue their entrepreneurial passions by fellow entrepreneurs Kerry Judd and Ray Lambert. Ms. Judd, the Founder of New Beginnings Inc. and the New Beginnings Education Trust, told students how she found happiness by pursuing her passion for the development of Bermuda’s young people. Mr. Lambert, who recently joined the EEZA as the St. Georges’ development officer, gave students a different perspective on success by drawing on his own experience as a Co-Founder and Manager of Snorkel Park in Dockyard. In addition to these speakers, Minister of the Economy, Trade and Industry Patrice Minors also applauded the students and offered them her support. She spoke of the enormous opportunity that exists for entrepreneurship on the island. Students then had the pleasure of discussing their business plans with her. On the second day, the teams delivered energetic presentations of their business plans to a three person panel. Michelle Khaldun, the Executive Director of the BEDC, Carlton Crockwell, of Security Associates, and Heather Telford of Telford & Electric were the judges. The first team consisted of Arthur Begeman, Jonathan Briers and Peter Miller, who proposed a brewery, Longtail Brewing. The second team, Allison Conyers, Kirsten Nusum, Sherie Jones, Chanell Darrell, Whitney Ming and Angela Dickinson, put forward a healthcare company, Fit-Future. The third team, Perri Furbert, Ranae Bean, Subira Dill, Nicole Nelson and Mary Sisa laid the foundation of a biking, walking and kayaking tour business, triathTOUR. The final group, Danielle Moniz, Kian Butterfield, Chardonnai Hughes, Shondelle Paynter, Collisha Hendrickson and Connor Ruberry, came up with a hydro-power company called BluEnergy. The whole presentation was filmed by Robert Zuill of CITV. The judges were resoundingly impressed by the ingenuity and entrepreneurial spirit of the students, who crafted realistic financial strategies in only two days. The workshop’s organizers, Imani Cherry, Aliyyah Ahad and Shain DeShields, were extremely pleased with the turnout as well as the enthusiasm of the students. The support they received from the community was integral to the success of the workshop. Island High Eatery and Jamaican Grill sponsored lunches for the event, and HSBC graciously opened its doors to the students. Additionally, Ray Jones, Erica Smith, Joe Mahoney, William Spriggs, Jamillah Lodge, Michelle Khaldun and Natalie Africa provided invaluable support. As university students themselves, the organizers were grateful that their summer internship at the BEDC gave them the opportunity to create such an event for their peers. The final message of the workshop was that regardless of whether you decide to start your own business, you can still apply an innovative and entrepreneurial spirit to your life and career. In short, that you can still be your own boss.